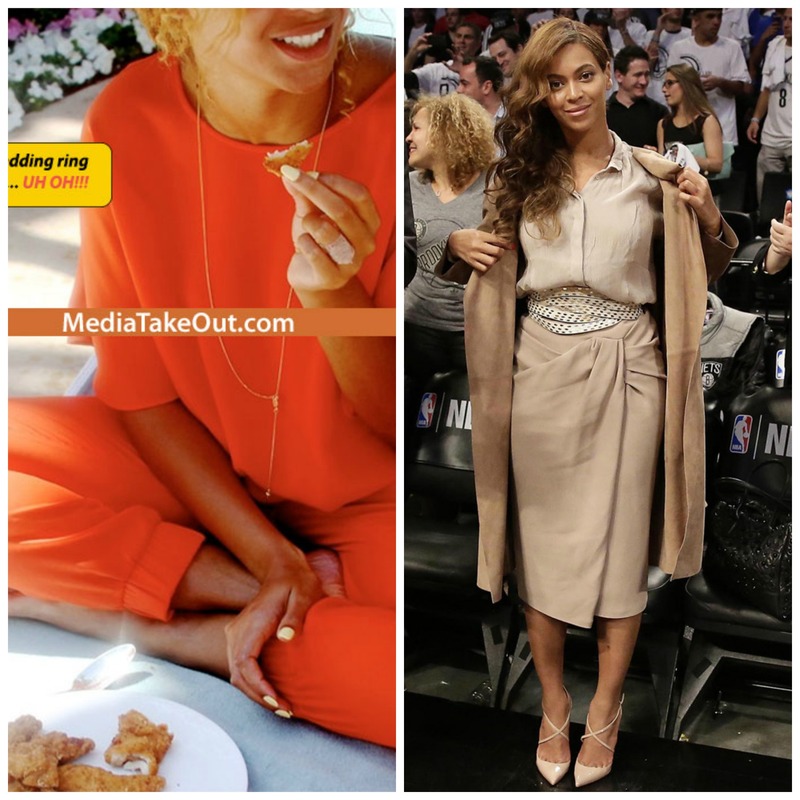 Solange has been out and about since the infamous elevator incident that has become somewhat of shadow to not only her, but to her big sis Beyonce and brother-in-law, Jay Z. 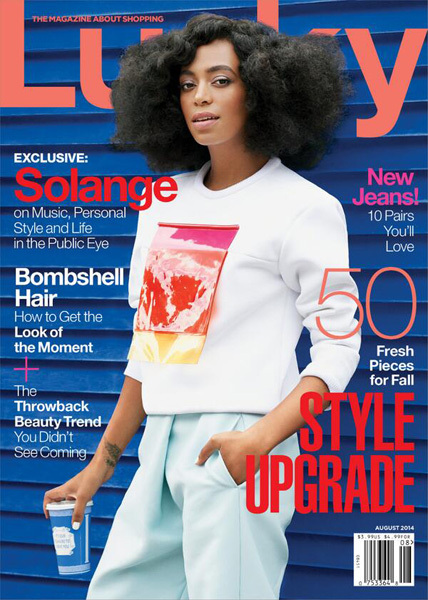 Well, she took to the pages of Lucky Magazine where she talked music, life, and the elevator incident. In other words, she’s not going to discuss the situation any further. We all saw the video yet as far as digging deeper into the situation, we’ll never know. 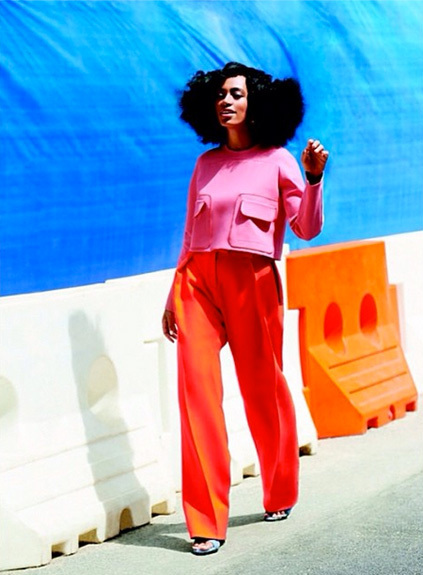 Not to be shadowed by her older sister, Solange has become more of a fashion symbol more so than for her music. Her music is a completely different sound that that of her sisters which I personally love. In the beginning of her career, when you listen to her earlier music, it wasn’t her. She didn’t really have a say so and I think that her 2008 album, Sol-Angel and The Hadley Street Dreams, really zoned in on her sound and the direction she wanted to go musically. Here’s what she said as far as dancing with Destiny’s child . 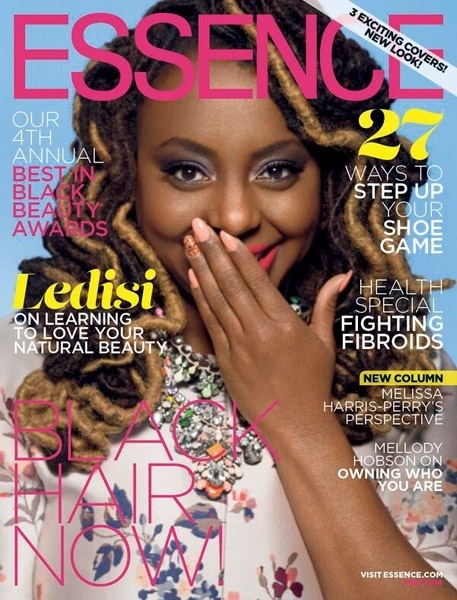 My last EP, True, was about the overall vibe—the message was fun. This one, I really want you to hear what I’m saying. I want you to hear me. It wouldn’t be an interview without mentioning her life as a mother. Here’s what she shared. I think about all of those phases that I went through and the ridicule and whatever that I experienced. And I can’t think of one time where I ever felt like I was going to break. That’s because I had confidence instilled in me by my parents. They didn’t always like it—in fact, most of the time they didn’t—but they never asked me to change. 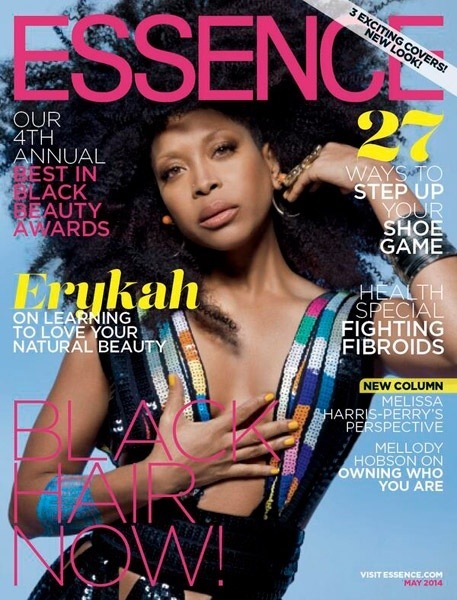 Check out more pics from the shoot below and head over to LuckyMag.com for the full interview. So before I go into any comment check out the video below. There was a longer version (via TMZ), but has since been deleted. I fill in details, but the video below sums up everything. So this altercation took place after the Met Gala (May 5) and there’s no denying that Solange did in fact attack Jay Z yet no one knows why. 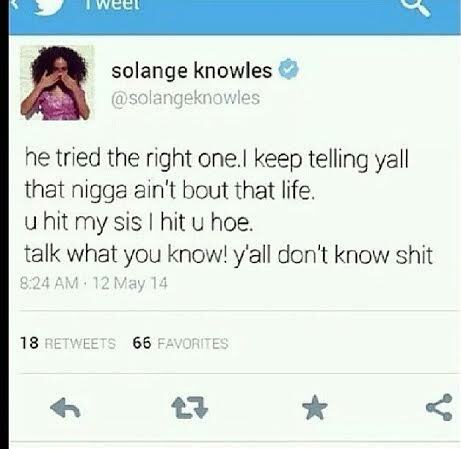 There was a ‘fake’ tweet, and I say fake due to how many likes/retweets, that was supposedly from Solange. Had that been an ACTUAL tweet it surely would have gotten more retweets, not just 18. 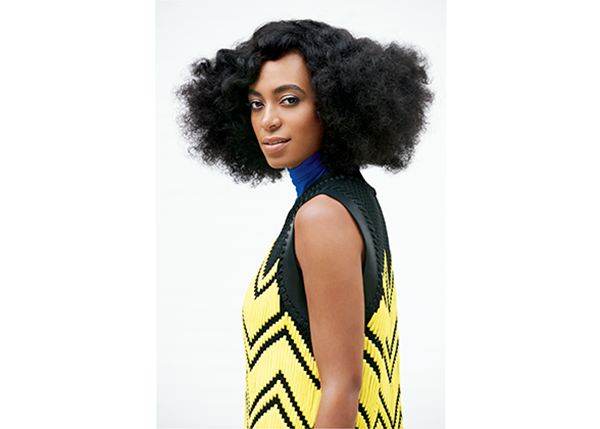 Of course the ‘tweet’ is no longer on Solange’s page. When it comes to the personal lives of celebrities, fans can become so engrossed and think that they personally know they person enough to judge. Regardless of how much MONEY a celeb has that does not make them any less human than the average person that works 9-5. First off one wouldn’t think that these two are having problems as they are sitting court side at the Nets playoff games, vacationing, and preparing for their first tour (‘On The Run‘) together. What made this so ‘newsworthy’ was that the lives of Jay Z and Beyoncé are so private that all you see is the perfection and supposed sexual innuendoes when the paparazzi catches them on vacation. There’s no problems between them. He loves her, she loves him, the family gets along, they have a beautiful daughter, etc. People IDOLIZE them as individuals and as a couple and from what I’ve seen, based on what they present to fans, it’s worth the admiration. The question is, what would make Solange tick to the point that she’s slapping, kicking, and supposedly spiting at her brother-in-law? Rumor has it that Jay Z is supposedly hitting on Beyoncé which is where the tweet stemmed from and the other is that a close ‘insider’ stated that Solange doesn’t like how controlling Jay Z is over her sisters life. Another one is that Beyoncé and Jay Z are set to be getting a divorce and that Beyoncé has had the ‘IV’ tattoo on her ring finger removed. In many pictures it’s there and then it’s not there. At the Met Ball it was there, but on the cover of Time it was not. Could be Photoshop, makeup, airbrush, a combination of the 3, who knows. If you look closely at the pic from the Nets game it doesn’t seem to be that way although another picture surfaced and she had tape around her finger. Two things there, touchup or it could be removal. I think she just uses makeup to do what she wants with it. I mean as close as Bey and her sister are I’m not surprised that Solange would step up to defend, if necessary, her big sis. 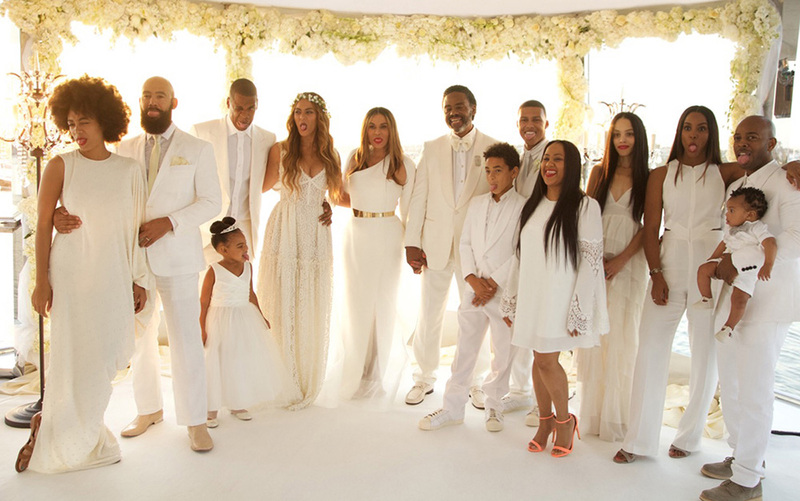 Was Jay Z’s ‘controlling’ ways worth all the drama in the elevator? Well whatever happened in that elevator only 4 people know: Beyoncé , Jay Z, Solange, and the bodyguard Julius. There’s no audio on the video and as much as I dislike TMZ this right here is pretty accurate. This is no spoof. It’s clear of who was in the video. 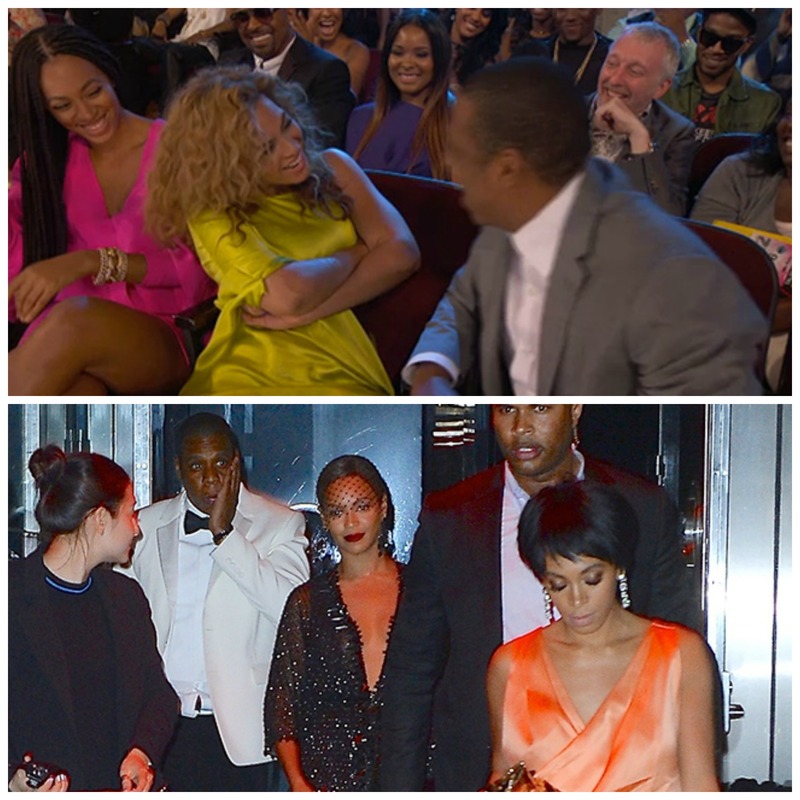 It’s clear that Beyoncé stood on the sidelines and watched the fight happen. It’s clear that Jay Z refrained from any further altercation with her although in the beginning he was pushing Solange back and grabbed her leg before she could land anymore kicks. In the end of the video he was pointing to his head as in a motion for Solange to ‘think’ about what she was saying. Beyoncé was on her way out the elevator with Julius in front with Jay Z behind her and Solange took that as an opportunity to throw another hit. Then there’s the people that claim they don’t care and that it’s their business, but even I find this story interesting and yes I’m interested in some type of update. Specifically the audio. My personal opinion is that no matter how mad Solange was that was no reason for her to attack Jay Z like she did because that’s exactly what she did. 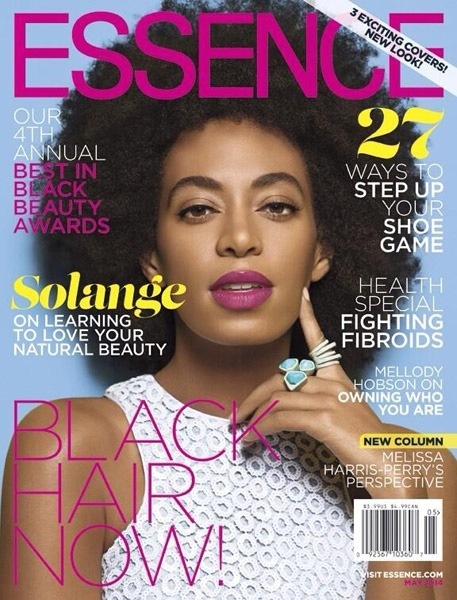 No this is not me standing up for #TeamJayonce v. #Team Solange. It’s clearly what’s right and what’s wrong. Had Jay Z put his hands on her, although he was provoked, not only would his entire image be tarnished, but he would be hypocritical of his dislike towards Chris Brown after his altercation with Rihanna. Just stating facts. No situation should ever result in violence and Solange could have handled the situation differently, but clearly it was anger that caused her to do what she did. A whole lot of anger. Was the video entertaining to watch? Yes. 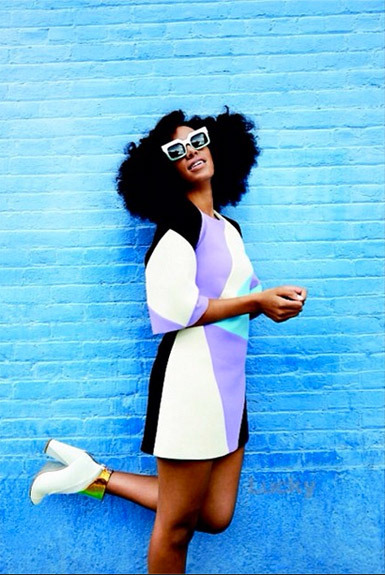 Were Solange’s actions justified? Who knows. Did she have a right to put hands on Jay Z? Regardless of what he did, said, etc., no she did not. The only way to clear up the rumor and to not make accusations would be to HEAR what was said. We can hope that maybe a statement would be released. Yeah, who knows if that will happen either. Only time will tell if that will happen, but in the meantime you can re-watch the video and guess the dialogue based off the body language or take the comedic approach and like all the memes on Instagram. I always knew that being 100% wholeheartedly me was going to pay off. Beauty looks like encouragement, patience, acceptance, forgiveness, carefulness, and compassion. Beauty is spiritual and physical. I started feeling beautiful because I came from beauty.